Do you want to have a perfect wedding day? It all starts with your getting ready. Here are the top 10 secrets for a perfect bride preparation from a wedding photography perspective. Why not enjoy the best day of your life with your wedding party without stressing out over the small details? Do you think this advice is unrelated to wedding photography. Trust me, if you and the girls have one or two glasses of champagne, you will feel great and your wedding pictures will look amazing. Comparing dry vs. wet weddings (where the girls had a mimosa or two), the images look way better when there is a bit of alcohol flowing. Obviously, you don't want to go crazy, but a drop or two won't hurt. Here is the deal: the makeup artists usually start the bride last so that she is fresh for the wedding ceremony. Still, often things run late and the bride does not have time for wedding day portraits. You know something? We have a better way of doing things. Have the makeup artists start with you, the bride. 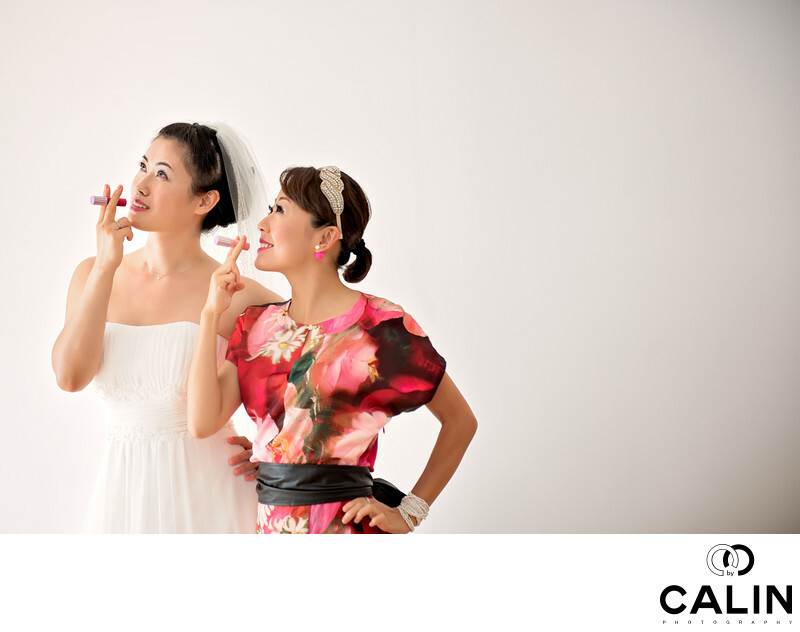 That way, you will have plenty of time for wedding photography and to have fun with your bridesmaids. Obviously, this requires a bit more work for the makeup artist and hair stylist but it is worth it. Before the wedding ceremony, they can simply touch up your makeup and everything will be perfect. Here's the deal: your makeup artist has a limited understanding of light. They often ask the bride to get ready in a dark room where the light is bad. This is crazy! Fine art, classic photography is about the quality and direction of light, period. With all due respect for the great work they do, you cannot allow your makeup artist influence your wedding pictures. Kindly get ready in front of a large window with no direct sunlight. Also, turn off any other lights in the room. Why? They have a different color temperature and "contaminate" the window light. We are often asked to arrive at the bride's house or hotel room before her makeup and hair are done. That is a mistake! In my long career as a wedding photographer in Toronto, I learned that a bride should be photographed only when she looks perfect. That is when the makeup and hair are done. Do you want to know a secret? All the pictures of brides getting ready you see on Pinterest or Instagram were actually taken after the hair and makeup are done. They are "pretend" shots and that's why the brides look so good in them. Often hair and makeup run late. If that is the case, your wedding photographers will waste precious time waiting for you. Have everything you want captured waiting on a table for your wedding photographers. I'm referring to your invitations, shoes, engagement ring and wedding bands, garter, bracelet, necklace, earrings, bouquet and any other elements you want photographed. That way, your photographers will not waste time if your hair and makeup will run late. Also, let your us know if there is anything that requires special attention. 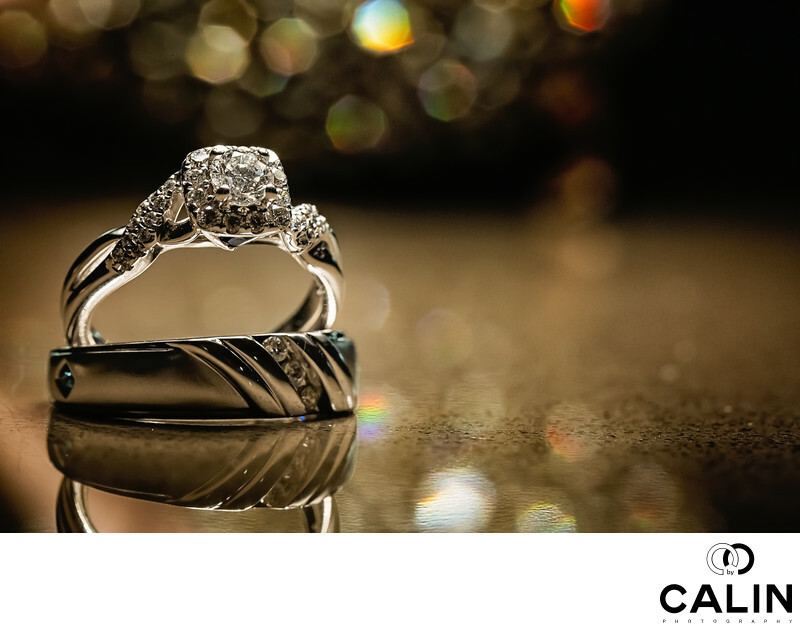 Your grandma's engagement ring passed to you, a medallion or any family heirloom you want photographed. After we take pictures of all the important wedding details, your maid of honour should pass the wedding bands to the best man before the wedding ceremony. There is no room for error on your wedding day! Unless you are having a destination wedding, book a trial makeup and hair session well in advance. That way, you avoid any surprises when your big day. Here's a secret. Have your hair and makeup done for your engagement session. That way, you will also see how your hair and makeup look in photos while you still have time to change it. You know something? Your engagement photo shoot is the perfect time to experiment and see if you really love the hairstyle you chose. Because some of my clients didn't follow my advice, they realized on their big day they didn't like their hair style and had it redone. Thy were so late, that when they were finished, we had to run to the wedding venue for the ceremony with no time for bridal portraits. Hair and makeup are not a perfect science! Most of the time, they take longer than the bride anticipates. Here's the kicker: even if you -the bride- like your hair, your mother or a bridesmaid will want a redo. Fortunately, when it comes to hair, everything can be fixed but it takes about 30 minutes to tweak the colours and the cuts. Especially if you have a large bridal party, build time buffers in case any of your bridesmaids will want a redo. Also, be realistic! Hair stylists are artists not magicians and even the best of them have limits. Pick the largest room in your house to get ready. That way, we will have lots of angles to photograph you and your bridesmaids. What if you are a couple who lives in a small condo in downtown Toronto. Not a problem! Rent a hotel apartment that will accommodate your bridal party. It is a great investment, not to mention you might be able to photograph inside that hotel. Want to know a secret? Many wedding venues offer a bridal suite where the bride and groom can get ready. Such suites are designed to accommodate even large wedding parties of 7-8 bridesmaids. Wearing beautiful robes helps your wedding pictures look good. While this is common sense, in the rush preceding the wedding day, this small detail is often forgotten. Here's the bottom line: as a professional photographer, I guarantee that your images will look much better if your girls wear pretty outfits and not sweatpants. Here's my next secret: as a bride, you should wear a different coloured robe to stand out. Often the brides' parents are so busy attending to the guests and organizing the perfect event that they do not participate at their daughter's preparation. Don't you want to see pictures your mom and you getting ready while you're flipping through the wedding album 30 years from now? I always advise brides to spend a few moments with their parents before they leave the house. That often results in very powerful images. Did you like this article? If yes, you might want to read Wedding Photographer's Tips for Brides.